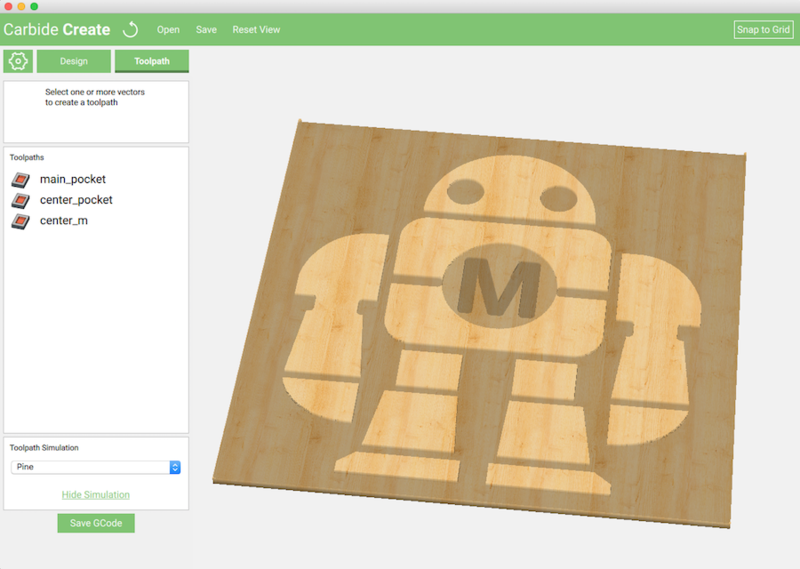 This is a quick and easy project to make on a standard sized Shapeoko 3 CNC machine. You’ll need a piece of material that measures 16” x 16” and is at least 1/4” thick. For this project we used 1/2” thick ACX plywood that was ripped down to 16” x 16”. Note: This job will be setup to start from the center of the material in the X direction, and approximately 7.5” from the front edge in the Y position. We used a 1/4” square end mill (#201 from our store) and the job will take about 23 minutes to complete. To begin, we need to clear the canvas and setup of material and job dimensions. 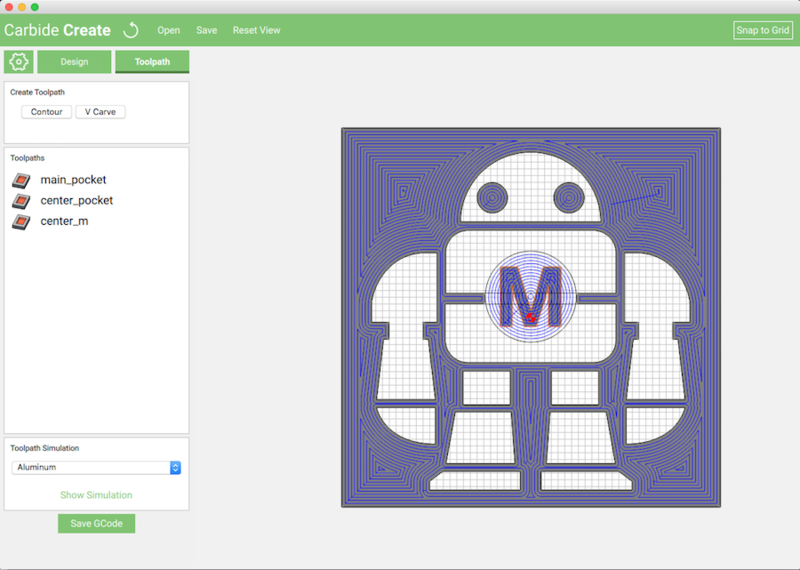 Browse for the makey_lrg.svg file you downloaded from the top of the page, and click OK once you find it. The file will open on the canvas. Once the file is open, select everything (click and drag or press ctl + a). 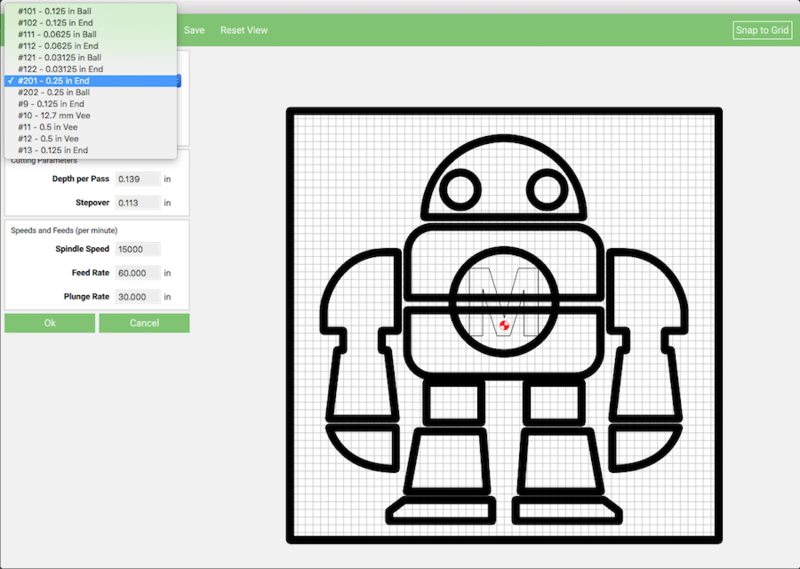 Once you have everything selected, center the design on the canvas. We’re going to be making a big pocket around the entire design, to give the pocket an outside edge you’ll need to create a rectangle that will act as our bounding box. 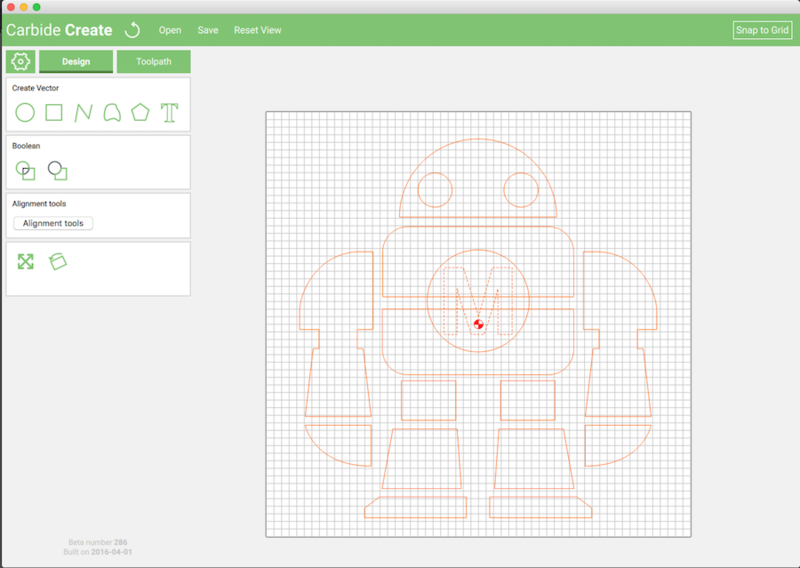 Now that the design is complete, you need to create the actual toolpaths. We are going to create 3 separate operations. 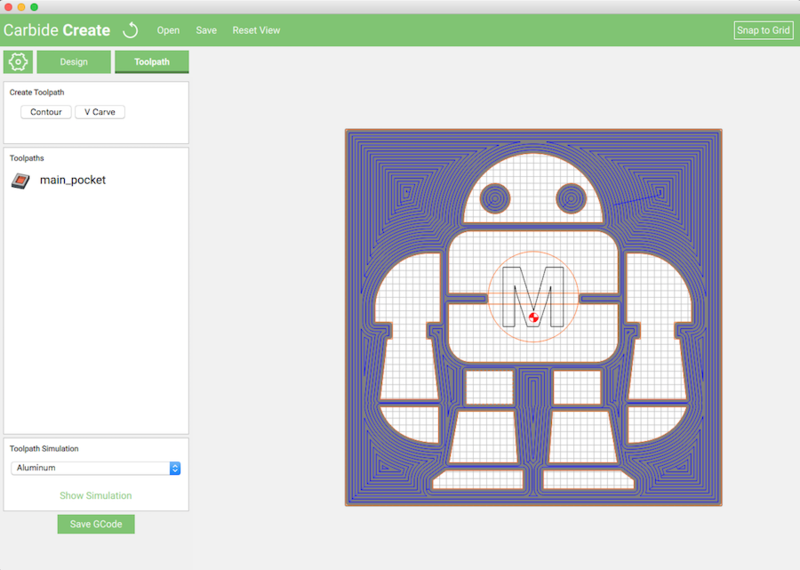 Select Everything on the canvas, and then, by holding the ctl (or apple) key, click the center circle and the letter ‘M’ to deselect those two objects. With all of those selected, create a new contour by clicking the ‘Contour’ button found below the ‘Create Toolpath’ menu. We will be using a 1/4” square end mill for all of the operations. Be sure the correct tool is selected from the tool drop down menu. Notice that the speeds and feeds will be filled in automatically for you. Also note that Carbide Create remembers the last tool you used and defaults to that tool. a note about speeds and feeds: these are set based on the material you selected during the ‘job setup’ process. If you decide to change the material you will be using, making sure you change it in the job setup screen too. Once it’s changed, come back to the toolpaths and verify the speeds and feeds have been updated accordingly. After you click ‘OK’, the pocket operation that you just defined will be created and a preview will be shown on the screen with blue lines. After the center_pocket has been created, notice that if you hover over the operation names, the toolpaths will turn shaded. The shading represents the depth of cut. The lighter the color gray, the shallower the cut. The darker the color, the deeper the cut. 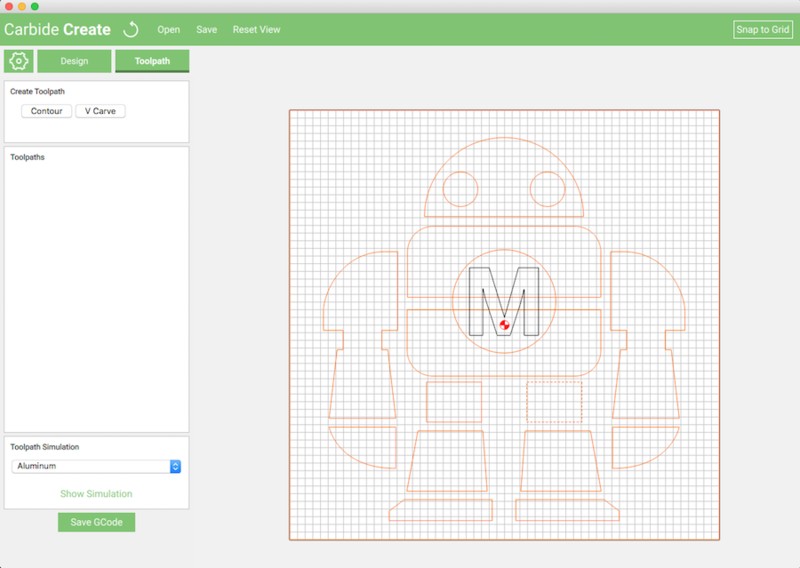 The final operation to create is the letter ‘M’ found in the center of the circle. In order to give the letter a little contrast we are going to create another pocket operation, but this time, the pocket will be cut deeper into the wood. Select the letter ‘M’ and create a new ‘Contour’. Now that the toolpaths are done and you’re happy with the preview, it’s time to setup the material on the machine and actually run the job! place the bottom edge of the material against the inside of the front cross strap. center the piece horizontally, there should be about 4” on each side. Secure the material to the Shapeoko. 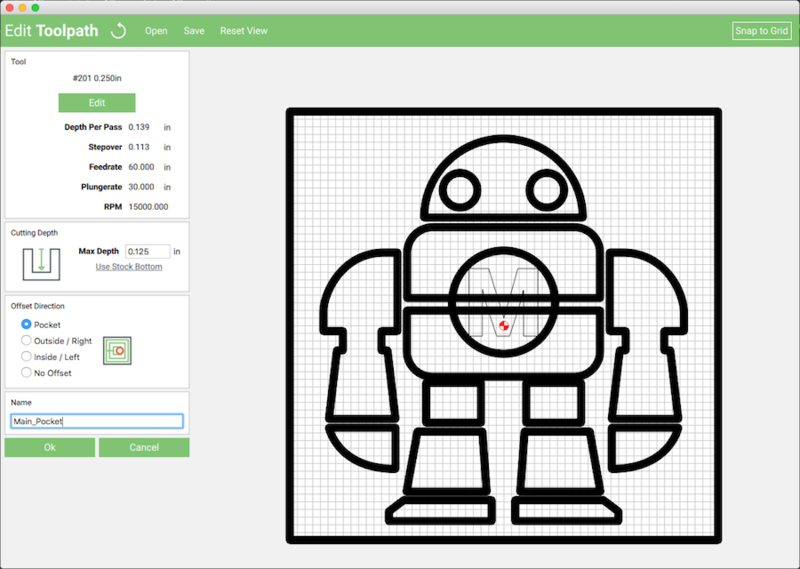 Mark the center of the material (horizontally) across the 7.5” mark you just created. This is going to be your job zero position. Before we can run the job, we need to setup Carbide Create and move the machine into the correct position to start. move your machine to the job-zero position, then turn the power on. Open Carbide create and Connect to your machine. Go to the jog menu and zero the X/Y axis. 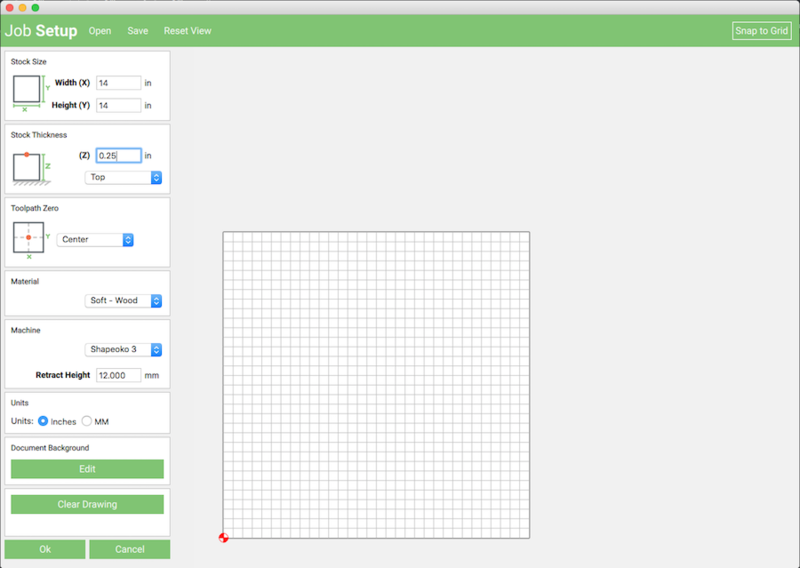 Jog the z-axis down until it’s just touching the material, then zero the z-axis. Load the .egc file you created with Carbide Create. With homing enabled, we need to reference the machine to home, and then create an offset to the job zero location. 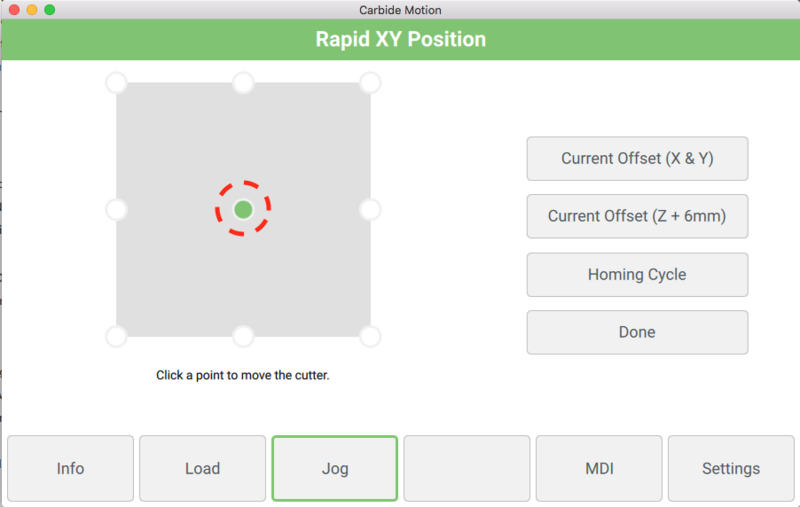 Power on the machine and connect with carbide motion. Click the jog button to begin the homing cycle. After the machine has homed, click the rapid position button. Once the machine has moved to the center rapid position, it should be close to the job zero position. Using the arrow keys on your keyboard, or the buttons in the jog window, jog the bit in the negative Y direction until it’s over the X/Y center mark you made on the table. When The bit in in the correct position, begin lowering the z-axis until it’s almost touching the material. We used a piece of paper between the bit and the material, slowly moving the paper around, until the bit catches the paper. Then you know your z-axis is in the correct position. 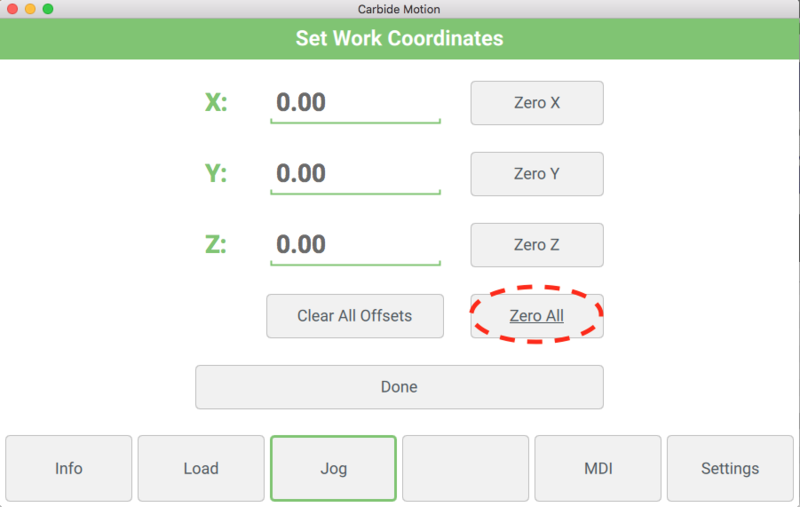 once X/Y/Z are in the correct position, use the zero button in the jog window. Click the ‘zero all’ feature towards the bottom. Then click done.